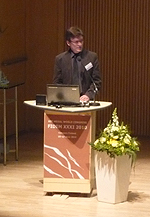 A welcoming address by Tapio Suominen started the congress in Tampere. He gave a short explanation to why Tampere is hosting the congress. A question raised in Colorado Springs opened the dialogue and possibility of hosting the congress with a fine result. The address was followed by a Finnish music performance by parts of the group Zoomie – Sound System. Deep Finnish and folk music gave a feeling for the country itself and its people. 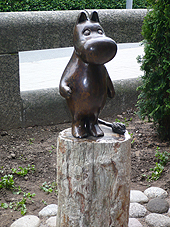 The Moomins and other Finnish forest creatures came to live in the Tampere Small Auditorium room. A welcome very different from so many others, so very heart warming. 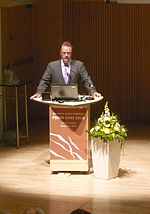 The XXXI FIDEM congress was officially opened by the Deputy Mayor of the city of Tampere, Mr Perttu Pesä. FIDEM's President, Mr Ilkka Voionmaa, made a trilingual opening speech speaking about FIDEM's history, presenting the FIDEM archives (Lisbon, Portugal) and the website. Encouraging members to make a good use of this medium. Mrs Gunnel Sievers, President of the Guild of Medallic Art in Finland, spoke about the Guild's co-operation with the Tampere Art Museum. 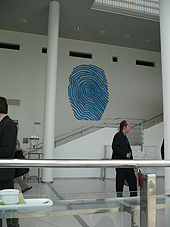 The two institutions shared the work of putting together this congress and exhibition. She also made some PR for the parallel exhibitions (small sculpture, Finnish medals and medals over writers) that are being held in Tampere. Mrs Sievers took the opportunity of thanking the President of Finland, Mrs Tarja Halonen, for her work and support as patron of this congress. A plenary lecture held by the Finnish sculptor Dr Jyrki Siukonen, professor at the University of Lapland in Rovaniemi raised the subject Medal and Its Negative and ended the official part of the opening of the congress. Lectures at the Tampere Hall and workshops at the Mältinranta Art Centre followed during the afternoon. Later in the evening the XXXI FIDEM Exhibition was inaugurated Art Medal in a Global World and Talking Substance - Nearby Sculpture was inaugurated.